A) gains electrons and gains energy. B) loses electrons and loses energy. C) gains electrons and loses energy. D) loses electrons and gains energy. E) neither gains nor loses electrons, but gains or loses energy. C) The more electronegative atom is reduced. D) The more electronegative atom is oxidized. E) A and C are correct. A) The covalent bonds in organic molecules are higher energy bonds than those in water and carbon dioxide. D) The electrons have a higher potential energy when associated with water and CO 2 than they do in organic compounds. A) NAD+ is reduced to NADH during both glycolysis and the citric acid cycle. B) NAD+ has more chemical energy than NADH. C) NAD+ is reduced by the action of hydrogenases. Where does glycolysis takes place? E) attaches itself to NAD+. Which step shows a split of one molecule into two smaller molecules? In which step is an inorganic phosphate added to the reactant? In which reaction does an intermediate pathway become oxidized? Which step involves an endergonic reaction? Which step consists of a phosphorylation reaction in which ATP is the phosphate source? Substrate-level phosphorylation accounts for approximately what percentage of the ATP formed during glycolysis? C) retained in the pyruvate. E) used to phosphorylate fructose to form fructose-6-phosphate. The free energy for the oxidation of glucose to CO2 and water is -686 kcal/mole and the free energy for the reduction of NAD+ to NADH is +53 kcal/mole. Why are only two molecules of NADH formed during glycolysis when it appears that as many as a dozen could be formed? Starting with one molecule of glucose, the ʺnetʺ products of glycolysis are A) 2 NAD+, 2 H+, 2 pyruvate, 2 ATP, and 2 H2O. B) 2 NADH, 2 H+, 2 pyruvate, 2 ATP, and 2 H2O. C) 2 FADH2, 2 pyruvate, 4 ATP, and 2 H2O. D) 6 CO2, 6 H2O, 2 ATP, and 2 pyruvate. E) 6 CO2, 6 H2O, 36 ATP, and 2 citrate. A) 2 molecules of ATP are used and 2 molecules of ATP are produced. B) 2 molecules of ATP are used and 4 molecules of ATP are produced. C) 4 molecules of ATP are used and 2 molecules of ATP are produced. D) 2 molecules of ATP are used and 6 molecules of ATP are produced. E) 6 molecules of ATP are used and 6 molecules of ATP are produced. D) has an increased chemical reactivity; it is primed to do cellular work. 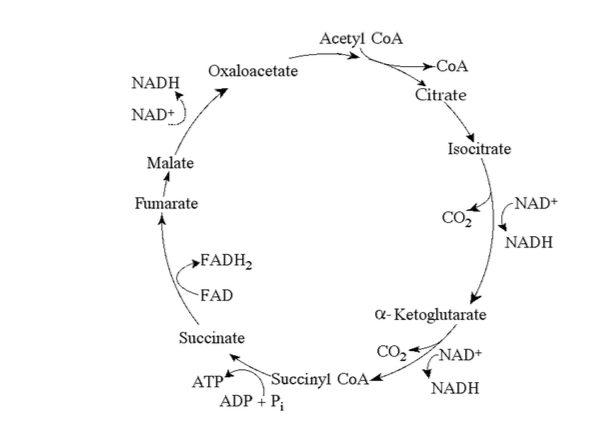 In the presence of oxygen, the three-carbon compound pyruvate can be catabolized in the citric acid cycle. First, however, the pyruvate 1) loses a carbon, which is given off as a molecule of CO2, 2) is oxidized to form a two-carbon compound called acetate, and 3) is bonded to coenzyme A. Why is coenzyme A, a sulfur containing molecule derived from a B vitamin, added? How does pyruvate enter the mitochondrion? Starting with one molecule of isocitrate and ending with fumarate, what is the maximum number of ATP molecules that could be made through substrate-level phosphorylation? Carbon skeletons for amino acid biosynthesis are supplied by intermediates of the citric acid cycle. Which intermediate would supply the carbon skeleton for synthesis of a five-carbon amino acid? How many molecules of carbon dioxide (CO2) would be produced by five turns of the citric acid cycle? How many reduced dinucleotides would be produced with four turns of the citric acid cycle? Starting with citrate, which of the following combinations of products would result from three turns of the citric acid cycle? Carbon dioxide (CO2) is released during which of the following stages of cellular respiration? For each molecule of glucose that is metabolized by glycolysis and the citric acid cycle, what is the total number of NADH + FADH2 molecules produced? Which of the following describes the sequence of electron carriers in the electron transport chain, starting with the least electronegative? In chemiosmotic phosphorylation, what is the most direct source of energy that is used to convert ADP + Pi to ATP? Energy released by the electron transport chain is used to pump H + ions into which location? D) the difference in H+ concentrations on opposite sides of the inner mitochondrial membrane. C) restoration of the Na+/K+ balance across the membrane. D) creation of a proton gradient. E) lowering of pH in the mitochondrial matrix. It is possible to prepare vesicles from portions of the inner membrane of the mitochondrial components. Which one of the following processes could still be carried on by this isolated inner membrane? Each time a molecule of glucose (C6H12O6) is completely oxidized via aerobic respiration, how many oxygen molecules (O2) are required? Approximately how many molecules of ATP are produced from the complete oxidation of two molecules of glucose (C6H12O6) in cellular respiration? Assume a mitochondrion contains 58 NADH and 19 FADH2. If each of the 77 dinucleotides were used, approximately how many ATP molecules could be generated as a result of oxidative phosphorylation (chemiosmosis)? Approximately what percentage of the energy of glucose (C6H12O6) is transferred to storage in ATP as a result of the complete oxidation of glucose to CO2 and water in cellular respiration? Recall that the complete oxidation of a mole of glucose releases 686 kcal of energy (Δ G = -686 kcal/mol). The phosphorylation of ADP to form ATP stores approximately 7.3 kcal per mole of ATP. What is the approximate efficiency of cellular respiration for a ʺmutantʺ organism that produces only 29 moles of ATP for every mole of glucose oxidized, rather than the usual 36-38 moles of ATP? In liver cells, the inner mitochondrial membranes are about 5 X the area of the outer mitochondrial membranes, and about 17 X that of the cellʹs plasma membrane. What purpose must this serve? A) It allows for increased rate of glycolysis. B) It allows for increased rate of the citric acid cycle. C) It increases the surface for oxidative phosphoryation. Exposing inner mitochondrial membranes to ultrasonic vibrations will disrupt the membranes. However, the fragments will reseal ʺinside out.ʺ These little vesicles that result can still transfer electrons from NADH to oxygen and synthesize ATP. If the membranes are agitated still further however, the ability to synthesize ATP is lost. After the first disruption, when electron transfer and ATP synthesize still occur, what must be present? After the second agitation of the membrane vesicles, what must be lost from the membrane? It should be possible to reconstitute the abilities of the vesicles if which of the following is added? 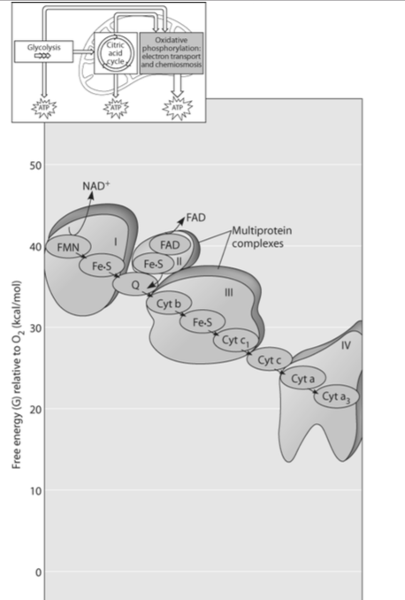 The accompanying figure shows the electron transport chain. Which of the following is the combination of substances that is initially added to the chain? Which of the following most accurately describes what is happening along this chain? The parts of the figure labeled with Roman numerals symbolize what concept? What happens at the end of the chain? A) The 2 original electrons combine with NAD+. B) The 2 original electrons combine with oxygen. C) 4 electrons combine with oxygen and protons. D) 4 electrons combine with hydrogen and oxygen atoms. E) 1 electron combines with oxygen and hydrogen. Which of the following couples chemiosmosis to energy storage? Which of the following describes ubiquinone? Which of the following normally occurs whether or not oxygen (O2) is present? Which of the following occurs in the cytosol of a eukaryotic cell? In alcohol fermentation, NAD+ is regenerated from NADH during which of the following? An organism is discovered that consumes a considerable amount of sugar, yet does not gain much weight when denied air. Curiously, the consumption of sugar increases as air is removed from the organismʹs environment, but the organism seems to thrive even in the absence of air. When returned to normal air, the organism does fine. Which of the following best describes the organism? A) It must use a molecule other than oxygen to accept electrons from the electron transport chain. B) It is a normal eukaryotic organism. C) The organism obviously lacks the citric acid cycle and electron transport chain. D) It is an anaerobic organism. E) It is a facultative anaerobe. Glycolysis is thought to be one of the most ancient of metabolic processes. Which statement supports this idea? A) Glycolysis is the most widespread metabolic pathway. D) The enzymes of glycolysis are found in the cytosol rather than in a membrane -enclosed organelle. E) Ancient prokaryotic cells, the most primitive of cells, made extensive use of glycolysis long before oxygen was present in Earthʹs atmosphere. B) It is found in the cytosol, does not involve oxygen, and is present in most organisms. D) It relies on chemiosmosis which is a metabolic mechanism present only in the first cells-prokaryotic cells. Muscle cells, when an individual is exercising heavily and when the muscle becomes oxygen deprived, convert pyruvate to lactate. What happens to the lactate in skeletal muscle cells? C) It is taken to the liver and converted back to pyruvate. D) It reduces FADH2 to FAD+. When muscle cells are oxygen deprived, the heart still pumps. What must the heart cells be able to do? C) increase in sodium ions. D) increase in potassium ions. vYou have a friend who lost 7 kg (about 15 pounds) of fat on a ʺlow carbʺ diet. How did the fat leave her body? B) Chemical energy was converted to heat and then released. Phosphofructokinase is an important control enzyme in the regulation of cellular respiration. Which of the following statements describes a function of phosphofructokinase? A) It is activated by AMP (derived from ADP). B) It is activated by ATP. C) It is inhibited by citrate, an intermediate of the citric acid cycle. 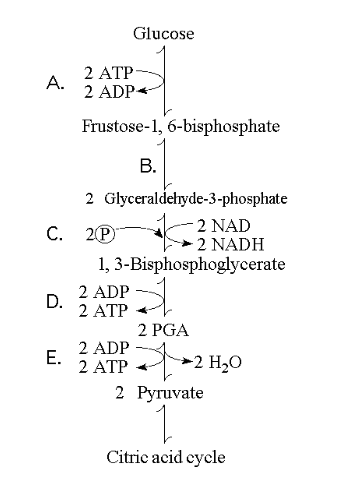 D) It catalyzes the conversion of fructose-1,6-bisphosphate to fructose-6-phosphate, an early step of glycolysis. E) It is an allosteric enzyme. A) inhibit the enzyme and thus slow the rates of glycolysis and the citric acid cycle. B) activate the enzyme and thus slow the rates of glycolysis and the citric acid cycle. C) inhibit the enzyme and thus increase the rates of glycolysis and the citric acid cycle. D) activate the enzyme and increase the rates of glycolysis and the citric acid cycle. E) inhibit the enzyme and thus increase the rate of glycolysis and the concentration of citrate. In vertebrate animals, brown fat tissueʹs color is due to abundant mitochondria. White fat tissue, on the other hand, is specialized for fat storage and contains relatively few mitochondria. Brown fat cells have a specialized protein that dissipates the proton-motive force across the mitochondrial membranes. Which of the following might be the function of the brown fat tissue? A) the oxidation of glucose and other organic compounds. B) the flow of electrons down the electron transport chain. C) the affinity of oxygen for electrons. D) the H+ concentration gradient across the inner mitochondrial membrane. E) the transfer of phosphate to ADP. E) are coupled via phosphorylated intermediates to endergonic processes. A) its double bonds are too stable to be broken. B) CO2 has fewer bonding electrons than other organic compounds. C) CO2 is already completely reduced. D) CO2 is already completely oxidized. E) the molecule has too few atoms. Which of the following is a true distinction between fermentation and cellular respiration? A) Only respiration oxidizes glucose. B) NADH is oxidized by the electron transport chain in respiration only. C) Fermentation, but not respiration, is an example of a catabolic pathway. D) Substrate-level phosphorylation is unique to fermentation. E) NAD+ functions as an oxidizing agent only in respiration.